i imagine that after working 8-10 hours in an office the last thing anyone really wants to do is come home and prepare a meal. i’m fortunate enough to make my own hours and work from home, and i still struggle with this. so i’m trying to think of ways to make life just a little bit easier. one of my ideas for this is prepping large batches of food to be used in multiple meals throughout the week. for instance, on sunday i made a huge batch of roasted sweet potatoes (cooked while we were roasting brussel sprouts for our sunday night dinner). and this morning i turned some of them into a breakfast hash, tomorrow i’ll make these with them and by wednesday just when i think i can’t eat another sweet potato, i’ll throw them into my lunch salad giving them a whole new life. this hash is the perfect hearty winter breakfast- a small bowl will get you through until lunchtime without even thought of a snack! this recipe is for a large batch…because leftover hash is almost as good as a room full of puppies. if you don’t like leftovers i recommend halving it to serve two. i hope you love! -coat a skillet with refined coconut oil, and sauté onions until just a little soft over medium heat. i need to make those tacos. i always try to do this but my bottomless pit husband somehow always eats it all that day! there is basically no amount of roasted vegetables that he can't consume. 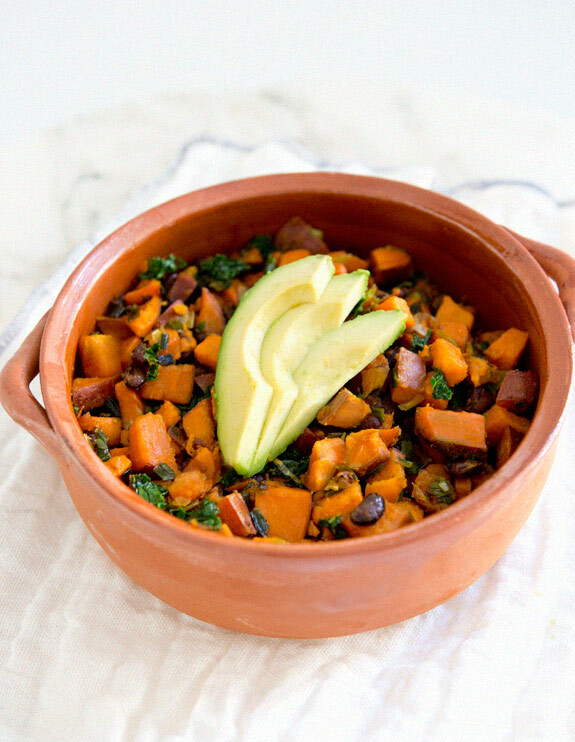 My best trick to staying healthy is planning ahead, like you did here with your roasted sweet potatoes! If I can shop/prep on weekends or early in the week I am infinitely more likely to stay healthy the rest of the week. This probably goes for most people, unfortunately it's also easier said than done! @kait- totally! it's all about making the time for it when you do have it. tricky to stay motivated to do sometimes but so worth it, right?! My "lazy/tired/rushed" food set-up includes having some healthy preserved foods around–mostly Mediterranean in nature, roasted red peppers, pickled carrots, olives, blanched and frozen vegetables, smoked fish in oil, artichoke hearts. As much as I prefer to eat freshly cooked foods, it's nice to have these options. And so easy to throw into a salad! I can never have enough squash recipes. This looks very warm and hearty – just what we need to blustery winter. I have come to accept that the only way to eat healthy in the way I want, and to actually make it happen, instead of just being a healthy eater in my head, and then always reaching for whatever's fastest, is to spend a good chunk of my Sunday planning recipes, grocery shopping, and cooking. I just recently tried your roasted chikpeas and it was a perfect all week snack for my salads and tacos. Little things! hi! de-lurking over here to comment. i love your photos, style inspiration and recipes! i think that planning ahead is totally the way to go. i try to spend a few hours on sunday planning and cooking as well. i always make soup or a big pot of lentils or some other bean. when i start to get sick of what i made on sunday, usually by wednesday, i throw the soup or beans in the freezer for the times when i haven't been able to do as much weekly food prep. i also work in an office and take my lunch everyday, so i always make a salad dressing and have some delicious veggies fixings ready for salad-making (beans, veggies, cabbage, roasted potatoes, etc). sometimes i toss my salad fixings with some kind of sauce and a grain also to mix things up. keep your recipes coming! thanks! Thanks for this post. What's your opinion on soaking beans in order to make them less gassy? How long should you soak black beans for, in this case?